Whether it’s the Alps, the Andes, the Rockies, the Urals or the Himalaya – Mountain ranges are an overwhelming natural phenomenon. These formations arise over millions of years – but how? 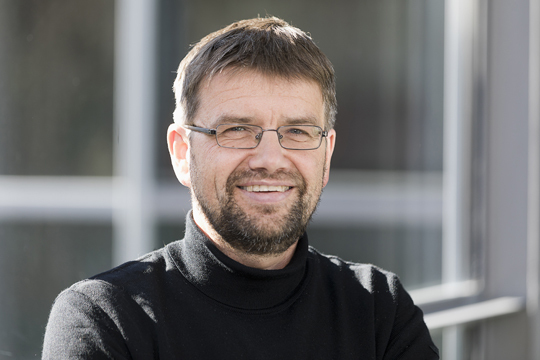 Professor Dr. Thomas Kenkmann has a newly-developed course to get an in-depth understanding of these complex geological processes across to his students. The trainee geologists have a lot of work to do. In the laboratory they create their own “mountain range” out of sand, glass beads and sandpaper, and use a computer program to simulate various models for range formation. 50 years ago, when the Sponti movement’s rallying cry was “Away with the Watzmann, clear views to the Adriatic!” the joke was that you can’t just get rid of a great big mountain like the Watzmann. Geologists see things differently. When you look at the Alps, you are seeing a highly complex, dynamic system which arises where continental plates move towards each other. The problem with mountain range dynamics is that they are very slow. Speeds of about one centimeter per year, in processes taking millions of years, are hard to track. Geology gets around some of this problem by regarding rock formations as snapshots of a very slow but unavoidable crash. Thomas Kenkmann of the University of Freiburg’s Geosciences explains this using a geological cross-sectional profile of the Alps from the Jura to the Po valley. He says it shows very nicely how the European continental plate is rushing underneath the African one and the upper rock layers from the north are pushing up against a hard wedge - and in this crash zone, are forming these bizarre patterns known as the Alps. It is important to Kenkmann to get his students visualizing the underlying processes not just as a static, two-dimensional model, but also as a dynamic system. That is why he developed his course on mountain range formation in the lab and on the computer – it is intended to give students an in-depth understanding of the complex geological processes. 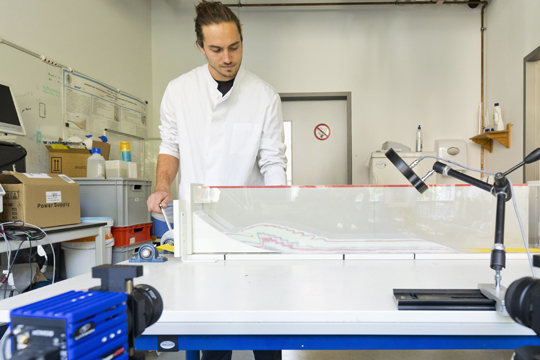 There’s no getting around a conventional theoretical introduction to the basics; but by step two the students themselves are taking action – by creating their own mountains in the laboratory. The academic assistants Bennet Schuster and Lois Mae Mayer have prepared and experiment in the lab to show how it works. In a long, hollow plexiglass construction, a simple hand-turned conveyor belt covered in sandpaper lays down the various layers of rock. 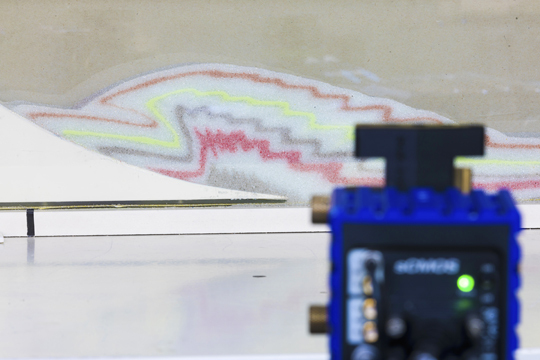 Schuster has set up a camera to document the experiment, while Mayer starts turning the conveyor belt handle, flinging colored glass beads up against a half-pipe-shaped wedge. What takes millions of years of geological time is squeezed into mere seconds. One can clearly see how plateaux and cliffs are created – with an uncanny similarity to the real ones in the Alps. Following an introduction about how the profiles created by this tectonic analogue model may be assessed quantatively, the students form small teams to investigate a number of issues: What role does the collision speed play? What effect does erosion have? To simulate this latter effect, the students like to use the vacuum cleaner. In a third step, the laboratory mountains measured by the camera provide the data for a simulation program. For this phase – from the low-tech sandpit to the high-tech of the computer – the students this winter semester 2018-19 will use a software package known as MOVE™ for the first time. It was developed by the Scottish company Petroleum Experts (Petex). 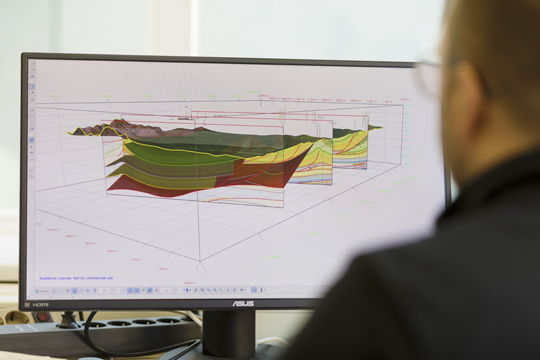 “We are only allowed to use this professional software because Petex waives the annual licensing fee of 1.308 million pounds sterling for us,” says Kenkmann happily – that means the company in effect sponsors Freiburg Geology teaching with the equivalent of 1.45 million euros. Kenkmann’s research assistant Dr. Michael Poelchau shows us on the screen how models of mountain range formation can run backwards and forwards like a three-dimensional animated flip-book. The new simulation software has another advantage for students – they can become familiar at this early stage with a tool which will be important in their later professional lives. The students appear enthusiastic about the opportunity to independently simulate mountain range formation with both high- and low-tech tools. They say it’s something they won’t forget. But comparing their results with reality will be the important thing - when they have a field trip to the mountains. That will reveal to what extent the knowledge gained from the experiment and simulation has helped the students to competently interpret the structures in real mountains.